last month, I had the privilege of attending the birth of my friend's second child. I got the call at around 8:30 p.m. on a Thursday night. I had just sat down to a nice bowl of fresh spaghetti when Jenny called and said she was having contractions every 15 minutes or so. I scarfed down my food, packed up my stuff, and headed out on the metro. Chris met me at the train station nearest Jenny's house and drove me the rest of the way there. i have to admit, I was pretty nervous that after so many months of anticipation, this was FINALLY HAPPENING! But I also felt strangely prepared and ready for anything. (It helped that Jenny got me two crucial books to read about birth.) when i arrived, the midwife was already there checking Jenny out. the contractions slowed down so we sat around talking and eating and we even watched the first part of a movie. We eventually all went to bed, but around 3 a.m., the contractions started again in earnest, and it was really game time. I won't get into all the details of the birth, but the baby was born around 9:20 that morning, and I watched the ENTIRE THING. it was pretty incredible. The labor was rather long and arduous, but Jenny was a real champ and I am still sort of in awe of her strength. I also found myself thinking a lot about advent: we'd been waiting so long for this little guy to finally arrive, and, down to the final minutes and seconds of his birth, all of us in the room were truly EAGER for just a glimpse of the little guy's head. when he finally came ... well, frankly there aren't words to describe the deep satisfaction we all felt. he was finally here. here. here. here. i visited the whole fam last week and it was amazing to see the baby, aware, alert, burping up a storm, and eating voraciously. what a BLESSING! I was the designated photog/videographer for the night. 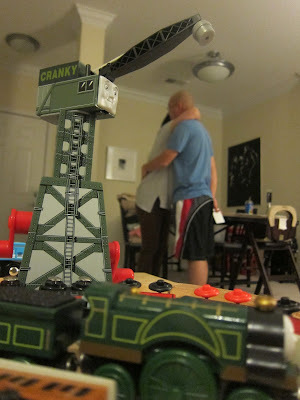 Obviously, all of the photos are pretty personal and won't be shared on this blog, but here was one capture that I totally love: mom leaning on dad during a contraction; in the foreground, big brother's toys that will hopefully be generously shared with the new baby to come.